The new plaque on the side wall of the old school building on the Upper West Side of Manhattan first built in 1882 glowed in the early afternoon of a splendid New York June day. David Mantle, 45, and Danny Mantle, 42, the two surviving of four sons of Yankee slugger and baseball immortal Mickey Mantle and his wife, Merlyn, held the strings of the cloth covering the plaque. Now the audience, assembled on West End Avenue and 82nd Street in Manhattan in front of the four story school building, could read the plaque. They had cheered loudly a few moments earlier when a red ribbon was cut by the two Mantle boys and the obligatory politician on the scene, Manhattan Borough President C. Virginia Fields, as balloons floated high and school children applauded. More than half a century after he first walked on the glistening grass at Yankee Stadium in 1951, the name of Mickey Mantle would now forever be enshrined in a New York school, this one for 200 children, mostly minorities, who were sent to this location as physically or mentally challenged students. Mantle’s notoriety came, of course, from 18 seasons with the Yankees, 536 homers, those blond good looks and his flamboyant lifestyle during those winning Yankee years. As described in my recent book, “Memories of the Mick” (Taylor Publishing) Mantle reached an even greater level of attention, affection and appeal in his final months of life before his death of liver cancer on August 13, 1995. He took the time then to truly inspire youngsters, to warm them of the evils of alcohol, a clear factor in his death at age 63, to admit mistakes in his years as a carousing husband and father, to motivate others to cleaner and clearer goals. Mantle had first come to New York with a big reputation as a young power-house and an attractive shyness naturally earned as a native of a tiny mining town of Commerce, Oklahoma. His father, Elvin, called Mutt Mantle by friends, was a zinc miner and he wanted the fresh air of baseball not the darkness of the mining holes for his son. He dropped a baseball into his crib and worked with him the next 18 years until the Yankees took over. 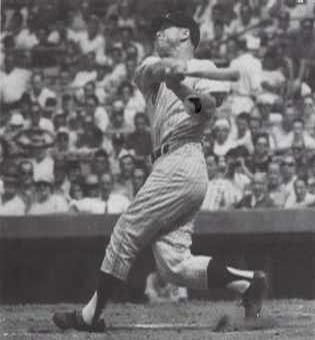 Mantle started in the spring of 1951 in Phoenix, Arizona and his teammate, Joe DiMaggio, was winding down his career in angered bitterness and just enough jealousy as attention shifted to the handsome youngster. DiMaggio made no efforts to welcome Mantle to the Stadium scene but that was typical of him. He was far too lordly in Yankee lore for any efforts in that direction. They almost collided while both were chasing a fly ball hit by Willie Mays in the 1951 World Series. 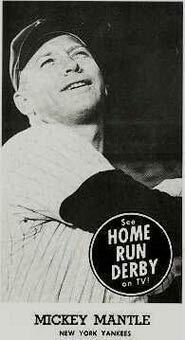 Mantle suffered knee damage when he stepped into a drain as he halted his chase of the ball at DiMaggio’s request. DiMaggio was gone the next year and Mantle took over as team icon. In 1956 he won the Triple Crown. In 1960 he was joined by Roger Maris and in 1961 they shared the most dramatic home run chase in history, as they challenged the Babe Ruth record of 60 homers in 1927, the stupid asterisk ruling concerning 154 games by Commissioner Ford Frick and the public antagonism. Mantle’s body, damaged by alcohol and injury, gave out in the middle 1960s and he walked away from the game with a disappointing .298 lifetime average after the 1968 season. He tried several things, broadcasting and coaching among them, private business, uncomfortable public appearances for pay and card shows in the middle 1980s. A New York restaurant owner named Bill Liederman convinced Mantle to allow him to use his name on a new sports hangout. “I wanted to make Mickey Mantle’s restaurant into the new Toots Shor’s, the famous sports place of the 1940s and 1950s. Mickey agreed and he really loved being part of the place,” Liederman said. Mantle would show up at the restaurant, sign autographs, kid with customers, entertain old teammates and revel in the glory of his past. The cancer had spread and despite a healthy new liver, he passed away in Dallas. Bob Costas handled the eulogy and reminded the huge crowd that Mantle’s fame cut across all barriers. Shortly after Mantle’s death a school principal named Philip Santise got the idea that a new name on his school would inspire the handicapped kids. “We thought of a lot of names like John Lennon who lived in Manhattan and a bunch of old politicians. Then I thought of Mickey. Why not a Mickey Mantle school? I started working on it,” he said. Seven years later, chopping laboriously through the New York City school bureaucracy, he was given approval. The Mickey Mantle School was engraved in front of what had started as Public School 9 about 120 years ago. Photos of Mantle filled the halls. The plaque was built. On that June afternoon the school band played, “Take Me Out to The Ball Game,” and “New York, New York,” before the ceremonies began. Family and friends spoke of Mantle. The students all seemed thrilled.